Have you guys ever travelled somewhere and even at the end of the trip you still have no idea how to say one word of their language? Yeah well, that was me with my recent trip to Vietnam. I’ve totally given up on Duolingo that claims to help you learn a new language. That app had me looking crazy in these streets! Ha! So this time around, I decided that I was going to wing it! NOT ONE WORD DID I LEARN! Not even one! I’m so ashamed, but on a brighter note, I had an amazing time improving on my mime skills! All jokes aside, if they are in the tourism industry, most people in Vietnam could speak a bit of English. If they weren’t, good luck to you and may the odds forever be in your favour!! I found that out the hard way with a taxi driver who couldn’t understand where I needed to go; while I was straight panicking, thinking I was going to miss my flight! But we’ll get into that a little later. Typical view of a Hanoi Street. Little chairs, little tables, lots of food with big flavours. Talk about no expectations; I mean I literally had no expectations going to Vietnam. I made the decision to go to Vietnam after seeing one picture that I really liked. I also wanted to end my year of travel on a high note, something totally different. So Vietnam it was. For anyone planning on going to Vietnam, just know that you do need a tourist visa to enter. I applied for mine online, and got a pre-approval letter. When I arrived at the Hanoi airport, I had to obtain the actual visa. I arrived in Hanoi at 1am. I had already prearranged for a driver to pick me up, because let’s face it; I am not trying to find a ride at that late night hour. When the taxi driver stopped, and signalled for me to get out, I had no idea where I was. There was no hotel to be found. It was actually an abandoned alley big enough for only motorcycles to get through. I’m not sure who he was speaking to when he said get out, but I know for facts; you would have to pry me out of that vehicle. He kept pointing down the alley saying ‘hotel.’ So I’m guessing he wanted me at 2am, to lift my suitcase, and carry on, and purse and walk down an abandoned alley? No sir. Thankfully, when he saw that I was not budging, he made a call and someone from my hotel came outside to assist me. Hanoi being the capital city of Vietnam is actually made up of many narrow streets that are not accessible by cars; just motorbikes only. Imagine this street at 2am. No cars, no motorbikes, no people. This is the street that my hotel was on that my taxi driver wanted me to walk down alone at 2am! No sir! 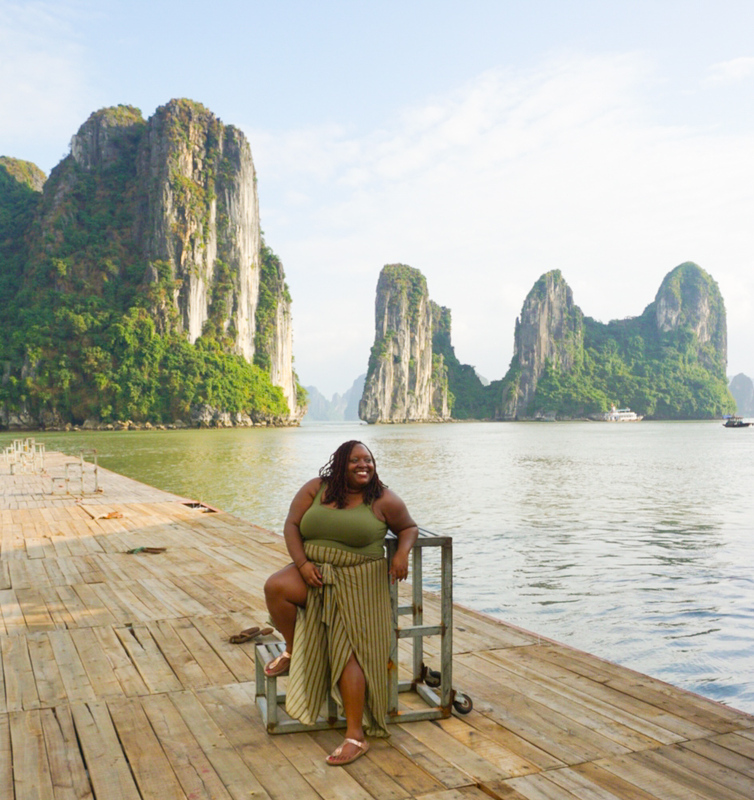 My time in Hanoi was limited, so with just 3 hours of sleep I woke up the next morning and jumped on a bus to Ha Long Bay. If you have ever seen pictures advertising Vietnam, and they show small islands protruding from the water; that is a picture of Ha Long Bay. It was about a 4-hour bus ride from Hanoi. They actually offer overnight cruises in Ha Long Bay, so you can sleep under the stars among the beauty of the islands. I opted for the day trip. During my day in Ha Long Bay, I experienced my first case of being a celebrity!! 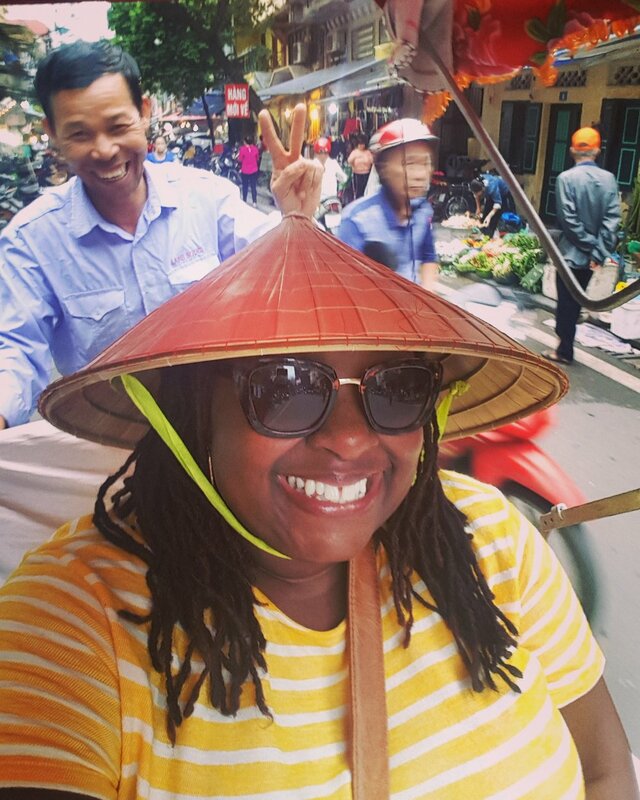 Although I shouldn’t be shocked, not a lot of Black people apparently pass through Vietnam. When the locals, especially in more remote areas see a Black person, it is instant celebrity status. People literally stopped to take pictures with me just because I am Black. Another Black solo traveller that was apparently a celebrity too. I didn’t mind sharing my spotlight. At first it was fun because as a whole, people were polite about it; later on in the trip I came across people who would see me then start to yell at their friends to come and take a look. I felt like a circus animal that people looked at in amazement. Some people showed admiration, while others pointed and stared. Needless to say, by the end of my trip, I did feel a bit broken. It’s hard to be by yourself and pretend that it doesn’t bother you when people stop and stare at you. Gone are the good old days when people would nudge their friends discreetly to point someone out. The pointing and laughing seemed cruel. I don’t know if the intent was to be cruel, but because of the language barrier I guess I’ll never know. Y’all are gonna take in this Black Girl Magic! Pho! 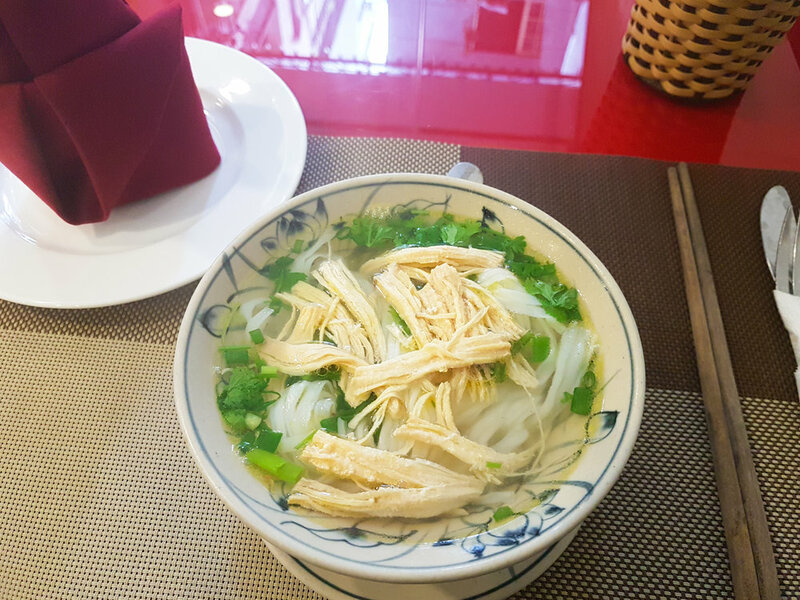 It’s pretty much chicken soup with rice noodles. To be honest, one day I decided to be adventurous and tried a fish dish and within minutes my stomach was doing the hot bubble dance which signalled that I needed a bathroom immediately!!! So for the rest of the trip, I had to play it safe. Vietnam is known for their seafood. Speaking of food, on my last day in Hanoi I took a taxi to discover the restaurant that Anthony Bourdain and Barack Obama visited when they taped an episode of Parts Unknown. When I arrived at the restaurant, I just wanted to get out for a few minutes and take some pictures. However my taxi driver insisted on being paid so he could leave. The arrangement that I had made with my hotel, was for the driver to take me to this location then take me back. But somehow these instructions got lost in translation. The driver wouldn’t let me out without paying, and I for sure wasn’t going to let him drive off and leave me! It took 2 phone calls to his dispatch, my incredible mime skills, and my Jamaican ancestors making an appearance in case someone needed to catch some hands, that he finally understood that I needed to be brought back to my hotel…Pheeewww!!! Anyways, the point is, although I did get to see the restaurant that Bourdain and Obama ate at, I really have zero evidence that I was there! Restaurant that the late Anthony Bourdain and Former US President Barack Obama dined at. On a Cyclo Tour…. which is really a bit of a death wish in Hanoi! There are many sides to Vietnam. The busy cities that never sleep like Hanoi; with lane ways small enough to only fit motorbikes, and copious amounts of street food to the beautiful resort cities like Hoi An. Check out my next post as I explore BaNa Hills and Marble Mountain from DaNang, Vietnam. -Maneuvering in traffic is like being part of the game Pac Man. It is not safe. There is absolutely no order. No one stops at intersections. It was a cross at your own risk type deal. What I was told by my guide; when crossing the street walk slow so motorists can see you, and won’t hit you. They won’t stop for you, but they won’t hit you. Comforting…. -I visited Ho Chi Minh Mausoleum. Ho Chi Minh was the former Prime Minister of Vietnam. I have never, ever been somewhere so strict. Firstly, you had to walk in a single file line. Don’t think that you’re going to step out of that line, because there are some immaculately dressed armed guards who will ensure you get back single file. Ho Chi Minh’s body lay in the mausoleum, in which again you had to pass by single file, no talking, and no pictures. A very intense place! -If you go to Vietnam, you must see a water puppet show. This is huge in Vietnam. It’s pretty much a puppet show, in water. These shows take place at sold out theatres. I’m telling you, it’s huge! -For a brief moment I was a millionaire in Vietnam. I just need you all to remember that when you’re addressing me. 1 Canadian dollar is equivalent to 17, 562 Vietnamese Dong. So it really didn’t take much to be a millionaire, but let me have my moment please! -It is very cheap to travel to Vietnam. I stayed in a beautiful boutique hotel. For 3 nights I paid $125 Canadian total! And that included Wi-Fi and breakfast! -Check out these crazy train tracks. People literally live so close to the tracks. Unfortunately, I didn’t get to see the train pass through this community, but it’s turned into a tourist ‘must see’ site, since it’s so unbelievable that people live this close to the tracks. Check out the man literally chilling on the train tracks! Crazy!